Can still hear that famously quoted loud shout from the iconic Bill Murray movie about reliving a day till you get it right. You know the quote – “IT’S GROUNDHOG DAY!!!!!. Geoffrey’s not driving ANGRY, like Bill Murray’s cute quadruped, but he IS prognosticating. A certain “polar vortex” of frigid cold temps is about to descend on most of the west and east coast states. And that means that people are casting a cautiously uplifted eyebrow at the notable groundhog, Punxsutawney Phil of Pennsylvania, as well as his picture book’s far flung cousin, named Geoffrey, plus all their iterations across the country, come February 2nd. They will either be the heroes or the goats er groundhogs, depending on whether they see their shadows portending an extra 6 weeks of winter, or no. While no shadow cast by Geoffrey and his cohorts, indicates an early spring! Just how how long has this groundhog named Phil been calling the shots on an early or late arrival of Spring? Well, The Punxsutawney Spirit, the newspaper of Punxsutawney, Pennsylvania, first mentioned the rodent’s predictions in 1886! 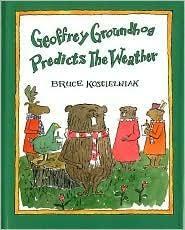 And Staten Island Chuck, groundhog of New York environs, has his own coterie of weather followers, come February 2. In fact, a certain newspaper in New York deemed Chuck the better prognosticator in terms of calling the early or late arrival of Spring. Chuck has been on the money 80% of the time, while Phil has registered a mere 40% . As I said before, the gentle Geoffrey and the equally gentle, yet demanding folk of his environs, are not ones to let him get away with one for one. Nope, he has to prove he’s on his game EACH YEAR or the groundhog fur will fly. And Mr. Koscialniak’s art here is so delightful and cartoonishly quirky. From his drawings of animal folk like Merton Moose, news editor of “The Daily Gazette”; circulation 359, to the sampler in Geoffrey’s mom’s burrow, stating “ Home in the ground, sweet home!”, Bruce has the ability to make this a place that you care about. And it is these small, eye-catching details that kids and parents will love picking out. My money is on Geoffrey, aided by mom, to get it right, once more. Gentle suggestion to weather forecasters: please give Geoffrey’s mom a jingle BEFORE you go on air with your upcoming winter storm snow amounts! “It’s not nice to fool Mother Nature.” Just plucked that bit of trivia out of my head from a 1970’s Chiffon margarine TV ad. Still works. Weather prognosticators: take note please! Hey, NEWSFLASH just in! BOTH Chuck and Phil are in agreement for an EARLY spring this year! And who is going to challenge these two renown rodents? Not me, folks. And certainly that challenge includes Geoffrey’s mom.